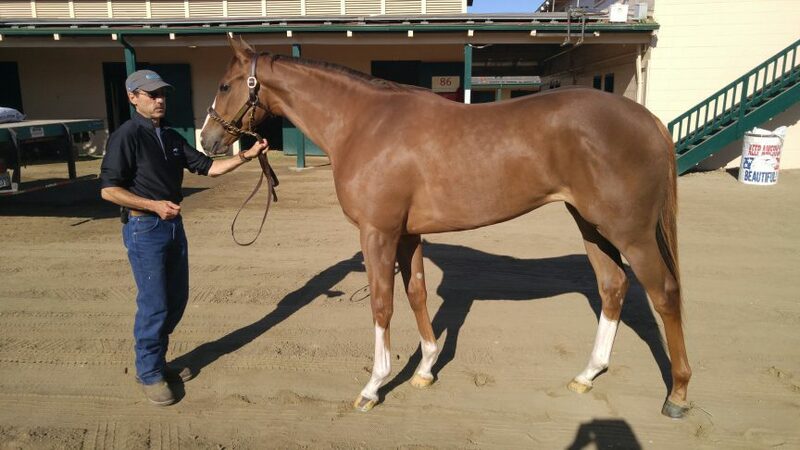 “On my maiden voyage to Del Mar for the Barrett’s 2 yr old sale I found a beautiful filly by Orb out of the Victory Gallop mare Day of Victory for Speedway Stable. She has all the class in the world which I love to see in a filly as it helps prepare them for the intensity of the racetrack environment. This filly reminds me of Pure Clan physically (let’s hope she is half as good). She is the same chestnut colour. In fact Pure Clan sold for $4,500,000 in 2012. She was a top class dirt and turf filly. She has a 2 yr old by Tiznow, a yearling fillly by Tait and is due to foal another Tapit in 2017. It is a top class female family and her sister Finley’s Lucky Charm ( trained by Bret Calhoun) was just pipped in the G1 La Brea if you look at the replays and should be a top 3 yr old this year. I love all the broodmare sires down the page, Victory Gallop, Dayjur and General Assembly.